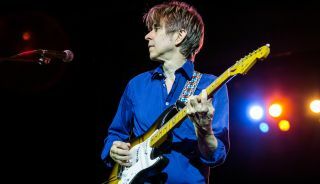 As much as he might try to deny it, Eric Johnson is a member of that small group of players sometimes referred to as "guitarists' guitarists." Players—like Jeff Beck, for instance—whose skills are (secretly, perhaps) the envy of his peers. Johnson is, however, well aware of the dual trademarks that are likely to become his legacy: instantly recognizable tone and a painstaking pursuit of perfection. "I've realized I've always been pretty hypocritical," Johnson told Guitar World in 2000. "My favorite albums have always had mistakes on them, but I can't stand to have mistakes on mine." Today, for your listening and viewing pleasure, we've gathered 10 of Johnson's greatest songs—tracks that we feel come pretty damn close to perfection. Although we've tried to make it a career-spanning list, we couldn't help but put a bit of extra emphasis on his 1990 masterpiece, Ah Via Musicom. We also couldn't help but include live clips of all 10 songs. After all, there are a hell of a lot of high-quality YouTube videos of Johnson in action. So sit back and enjoy some of the finest guitar playing you'll hear—and see—today! And even if you don't agree with nine of these 10 choices (no one's making an Eric Johnson best-of list without "Cliffs of Dover"), it's pretty much impossible to fault the playing in these 10 clips. "Mike [Stern] was saying we should have an up-tempo blues piece for [Eclectic], which I thought was a cool idea," Johnson told Guitar World last year. "While I was figuring out what to do, I started thinking about some of those old Benny Goodman records where there’s just a couple of chord changes, but it still has that blues vibe." "That's a really cool track with a Texas-swing feel to it," Stern added. "I originally didn't know how Eric wanted to do it, but once [drummer] Anton [Fig] started playing the back beat, I immediately got where he was coming from." On the gutsy, blues-rock stomper “Austin,” Johnson fills the verses with glassy, jazzy chords before letting loose with a jaw dropper of a solo in which notes seemingly somersault over one another. And speaking of Austin, “S.R.V.,” from Johnson‘s Venus Isle album, was written as a tribute to fellow Austin-based guitarist Stevie Ray Vaughan, who died in 1990. The studio version of the track features a guest solo by SRV's big brother, Jimmie Vaughan, who also appears on "Texas" from Johnson's Up Close album (The track also features fellow Texan Steve Miller). “This song was kicking around for a few years, and I could never figure out what to do with it," Johnson told Music Radar. "Sometimes it takes a while for a number to find a home. And the funny thing is, this was the last track that I cut for the album, the one that I had in my back pocket for so long. As "Trail of Tears" proves, there's nothing quite like the sound of a '54 Fender Strat going through a 100-watt Marshall head. Especially when Johnson is playing it. Here's a touch of jangly Eighties pop made glorious by its guitar solos. In this particular video, Johnson's guitar is way too low in the mix during the first solo (although we have no problem at all hearing that snare drum); the problem is repaired in time for the second guitar solo. Here's "Trademark," one of the lesser-known Ah Via Musicom instrumentals, which has a definite Eighties vibe to it, often even bringing the Police's Andy Summers to mind. It's another fine example of the magic Johnson can conjure with a Strat. "I guess 'Zap' is the only one we cut head on," said Johnson of the exciting, Grammy-nominated exciting fusion-rocker from Tones. "We recorded that as a three-piece, and I added just a very little bit of overdubs." Here's this list's official smooth jazz entry, "Manhattan," from Venus Isle. “I don’t even know if I can take credit for writing ‘Cliffs of Dover,’ ” says Eric Johnson of his best-known composition. Luckily, wiser heads prevailed on Ah Via Musicom. Though he had been playing “Cliffs of Dover” live for four or five years by then, it still took Johnson multiple takes to nail the song to his satisfaction—and he was never pleased with any version. “The whole solo is actually a composite of many guitar parts,” Johnson says. “I knew exactly how I wanted it to sound—almost regal—and though I had versions that were close, none quite nailed it, so I kept playing around with different permutations of the many versions I had recorded until I got it just right. “As a result, I actually ended up using two different-sounding guitars. Almost all of the song is a Gibson 335 through a Marshall, with an Echoplex and a tube driver. But in the middle of the solo there’s 20 or 30 seconds played on a Strat. It really does sound different if you listen closely and at first I didn’t think it could work, but I really liked this string of licks so we just decided to keep it. It basically just sounds like I’m hitting a preamp box or switching amps."